Executives are basing more and more decisions on facts. This is especially true when it comes to making strategic decisions that pertain to the workforce. Today, savvy business leaders and HR professionals are making data-driven decisions by leveraging the power of workforce analytics. 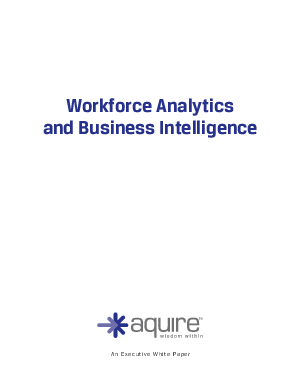 This white paper walks you through common obstacles executives face when it comes to capturing accurate analytics, how companies are using predictive analytics to guide future decisions and how aligning historical trends with future business strategies can significantly in workforce planning decisions.